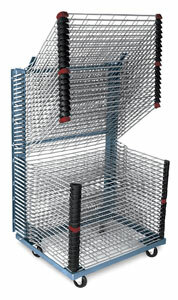 These junior size drying racks feature durable, all-steel construction. They're perfect for small sheets, standard size posters, and imperial watercolor sheets. Trays are mounted to a strong back frame, and can be positioned up or down using a spring suspension system. Each tray measures 22" × 32" (56 cm × 81 cm). Trays are spaced 1.125" (28 mm) apart in the down position. Mesh opening size is 4" × 4½" (102 mm × 114 mm). Racks are on casters for easy mobility. The floor space or footprint required for each rack is 28" × 32½" (71 cm × 82.5 cm). Racks ship unassembled by truck. Instructions for assembly are included. Note — The standard lead time for delivery of these large racks is 3 weeks. Rack with 40 Trays — Measures 52" (132 cm) tall with the trays down, and 64" (162.5 cm) tall with trays in the up position. Shipping weight is 238 lbs. Rack with 50 Trays — Measures 67" (170 cm) tall with the trays down, and 79" (201 cm) with trays in the up position. Ships unassembled. Shipping weight is 276 lbs. To view a PDF of the Assembly Instructions for the Saturn Junior Size Multi-Racks, please click here.